Spring Equinox is the mid-point in Spring—its HIGHEST DAY, its penultimate. It is a time of equal day and equal night, where the days start growing longer, after winter has passed away. It's when the gestation period is over and creation splits open—BIRTHING YOU! And the natural World is birthed into being. Two Archetypal Female Aspects of the Divine are present on this Holy Day: the Maiden, the child within you that returns each year and deserves to be healed and honored, and the Midwife, the aspect of the Divine that pulls you forth from the cosmic egg into the physical realm of Creation—giving you new ideas and strengths to live your purpose. In the Judeo-Christian Worldview is Easter—a time of rebirth...one that harkens back to the ancient world where the Goddess Ostara or Eostre was worshipped as the Maiden Goddess of Spring, fertility and rebirth. 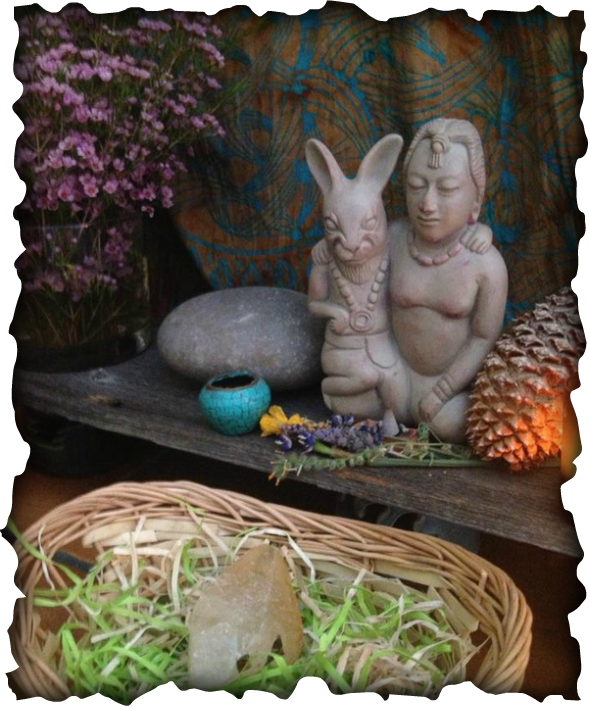 It is believed that from the German Goddess Ostara, the name Easter was derived. The symbols that most Westerns have come to associate with Easter, such as the rabbit and eggs were associated with the Goddess Ostara. A Goddess from the Americas, the Mayan Goddess Ix'Chel was also associated with Spring and rebirth. She is a Midwife and healer as well. Both of these Goddesses had a rabbit as a companion, their totem creature who represented their power. Eggs also appear as a symbol for this Holy Day—there is the belief that the yellow yolk represents the Sun God and the white the Maiden Goddess, together they represent rebirth. As an interesting side-note, hens, when left to their own devices, only produce eggs when they get twelve or more hours of sunlight. Spring Equinox is the first day that happens each year. For Sacred Circle Keepers this is the time of great healing, gathering your resources and setting off in the direction of your Destiny. Because of the fact that you are honoring the Maiden part of yourself, as well as the Midwife who births you into being and heals you—the ritual contains several layers of deep work. A Soul Retrieval to heal the child within occurs first and then a journey occurs which is designed to give you a new strength so you can move towards your purpose. The work for this set of rituals is very intense. There is a Soul-Retrieval & Birth Ritual, a Purpose & Strength Ritual, and then the EAST Stone Activation. As you can see, there are three distinct parts to this ritual and it is designed to heal you of past trauma, so that you can move forward in your life with your purpose and new-found strength. The first ritual creates a safe container through the cutting away of energetic cords that may be hindering your process. It then provides a protective barrier around you so you can proceed into a Journey-Work to retrieve part of your soul. A birth of your fresh spirit occurs at the end of this ritual. Then in the second part, you go to the Divine Midwife for tending of your purpose—at which point She grants you a new strength with which to show up in the world. The final part is integrating the energies that you’ve worked with into your East Stone and activating it in the same way you have done with the others.